Authors: Carla O'Dell and C. Jackson Grayson, Jr. 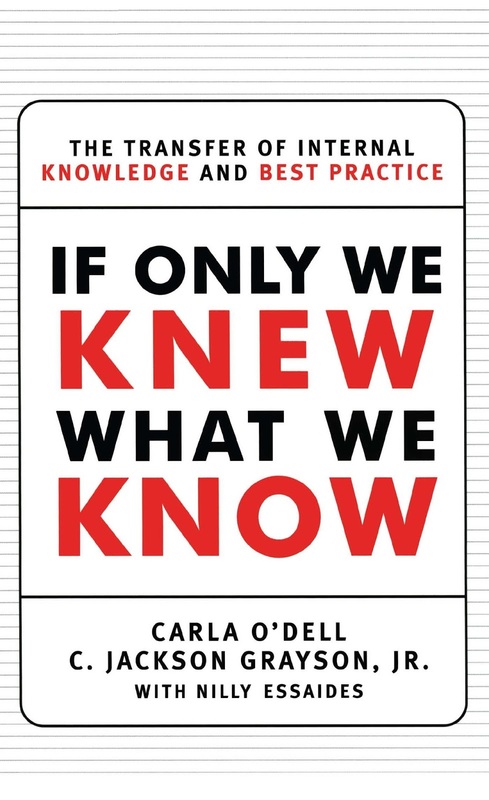 This book can probably be tagged as a classic, or at least one of the better known books on Knowledge Management and part of the early wave. It was first published in 1998. 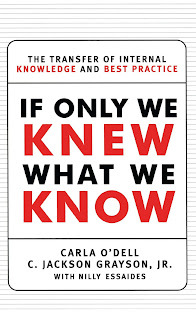 Carla O'Dell is still doing a great deal of work around Knowledge Management within a broader agenda at the APQC. There is a consistent style and format to everything APQC does. It's a bit like a Harvard Business School article. You can expect something very readable, practical, accessible to people who are new to knowledge management, and an excellent source of benchmarking information. Some books age better than others. I'd say there's nothing wrong with this book even though it's almost 20 years old, but as with any older book, any mention of technology is going to be very outdated. The principles behind the integration of technology might still be valid, but the specific technologies and technology challenges have changed. The idea that there is a wealth of internal knowledge that is underutilized in most organizations is still highly relevant and valid. Leveraging internal knowledge in the form of best practices, for example, is still very valuable. However, I have developed over the years a certain skepticism about best practices. First, the world is moving too fast for best practices to be valuable for very long. There is a need for a very dynamic approach to knowledge management, a greater focus on knowledge flows. Developing best practices can turn into a labor intensive, time consuming effort that results in something soon outdated and overtaken by events. Second (and a related point), it can be difficult to differentiate best practices from common sense basic knowledge and a lot of effort can be spent reinventing the wheel when that time and effort could have been better spent looking for emergent knowledge and focusing more on innovation and constant improvement. Organizations fail to "know what they know" when they've built internal knowledge silos over time with very little sharing across organizational boundaries. This is often the result of a mix of cultural barriers and inhibiting organizational structures. Both need to be addressed to enhance organizational knowledge flows. No, just read a published summary and follow up with The New Edge of Knowledge: How Knowledge Management is Changing, as an update to this early volume.